The Pioneer Woman has a new boutique hotel in Pawhuska, Okla.
She’s a chef, blogger, photographer, writer, and television host. Now The Pioneer Woman, a Food Network star, has added another occupation to her resume: hotelier. 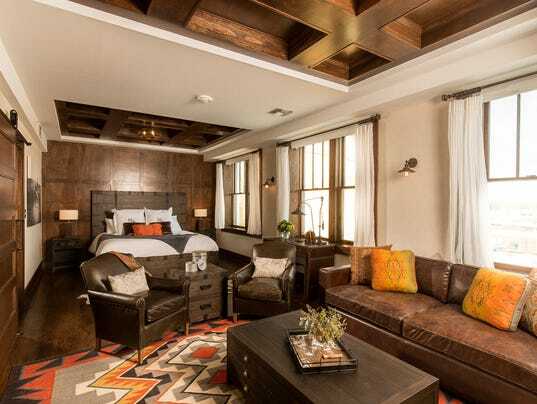 Ree Drummond, The Pioneer Woman, recently opened an eight-room “cowboy luxury” hotel called The Pioneer Woman Boarding House in her hometown of Pawhuska, Okla.
Drummond and her husband Ladd spent nine months renovating a building constructed in 1920 that was once a J.C. Penney department store. The smallest room is The Photograph Room at 468 square feet. The largest is The Drugstore Room at 814 square feet. The hotel is located in Osage County in the Tulsa metropolitan area, where the Drummonds have a ranch. Pawhuska’s population peaked at almost 6,500 in the 1920s during the oil boom. But as the boom went bust and the recession set in, Pawhuska’s population steadily declined to about half what it was. Drummond has been instrumental in the recent revitalization of Pawhuska. She has already opened The Pioneer Woman Mercantile–a restaurant, bakery, and store. She also has a pizzeria called P-Town Pizza. And a steakhouse is in the works. Each room in the Boarding House has its own personality and style. The husband and wife team each took four rooms to decorate. The suites include The Emerald Room with bright green accents; The Butterfly with pictures of, yes, butterflies; The Boudoir with burgundy velvet furniture, sparkly chandeliers and glossy black paneled walls; and The Ranch, Prairie, and Tack Rooms that all have heavy cowboy themes. Drummond describes her husband’s style as “very rustic, practical and utilitarian.” His rooms have durable wood, concrete surfaces and black or bronze fixtures. Drummond says it was her husband’s idea to open the hotel, but she was quickly convinced to do it. Although she had a few sleepless nights prior to the hotel’s opening, she is now enjoying being a hotelier.